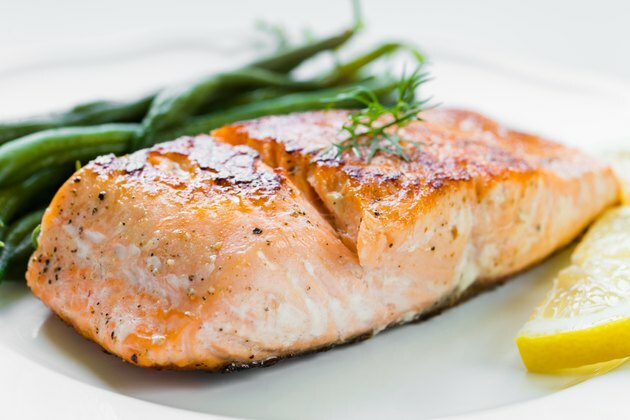 Atlantic salmon is fatty and high in omega-3s, which is exactly the type of fish the American Heart Association recommends that you eat at least twice weekly. Though wild Atlantic salmon is an endangered species, the Atlantic salmon at your local grocer's is almost certainly sustainably farmed. No matter the cooking method, Atlantic salmon is typically moist and flavorful. Choose a cooking techniue that both suits the supplies you have on hand and goes well with the rest of the meal. Place a thawed salmon fillet on a clean surface and sprinkle both sides with a sparse coating of salt, pepper, lemon pepper, paprika and any other seasonings you enjoy. Let the seasoned fillet rest for a couple of minutes to bring the flesh closer to room temperature so it cooks faster. Heat a nonstick skillet over medium and add a drop of olive oil. If you don't have a nonstick skillet, you'll need about 1/8 inch of oil to prevent the salmon from sticking. The skillet is ready when the oil shimmers from the heat. Set the seasoned fillet in the preheated skillet -- skin-down, if it has skin -- and cook it until it's crisp on one side. Flip the fillet and continue cooking it until a meat thermometer inserted at the thickest point reads 145 degrees Fahrenheit; serve it immediately. Preheat your steamer while you prepare the salmon -- the water should be boiling before you place the fish in the steamer. Place a thawed salmon fillet in a heat-safe bowl and add enough lemon juice to submerge the fillet halfway. Sprinkle salt, pepper and other seasonings over the fillet. Alternately, use soy sauce and place lemon slices atop the fillet. Set the bowl in the steamer basket and place the lid on the steamer. In 10 to 12 minutes, the salmon should be ready to serve. Check with a meat thermometer to ensure the flesh reads 145 degrees Fahrenheit before serving, and let it steam for another few minutes if it's not quite at the correct temperature. Place a large sheet of aluminum foil on a flat surface and preheat your oven to 425 degrees Fahrenheit. Coat the foil with a thin layer of oil to prevent sticking. You don't need a baking sheet or pan for this method; the aluminum foil will contain any mess. Set the salmon fillet in the center of the sheet of foil and sprinkle it with seasonings. Nestle chopped fresh vegetables around the salmon fillet to cook your dinner all at once; the vegetables in the pouch are optional. Gather the edges of the foil up around the contents and then roll, crimp or pinch the edges together. The foil pouch must be primarily air-tight to keep the salmon from drying as it bakes. Once sealed, transfer the pouch carefully to the oven. Remove the foil pouch from the oven with a pair of tongs after 15 to 20 minutes. Carefully open the foil and check the salmon's internal temperature with a meat thermometer to ensure it is at 145 degrees Fahrenheit before serving. Bake the salmon for a few more minutes if it is not. Serve the salmon and veggies by setting the opened foil pouch on a plate for a lovely presentation. Refrigerate leftovers immediately and eat them within three to four days. Always reheat your leftovers to 165 degrees Fahrenheit per the recommendation of the Food Safety and Inspection Service. If you don't have aluminum foil, you can use parchment paper to make a pouch for the salmon. Staple the parchment closed or tie it shut with kitchen twine instead of rolling it like foil. The parchment pouch method requires no oil to prevent sticking.